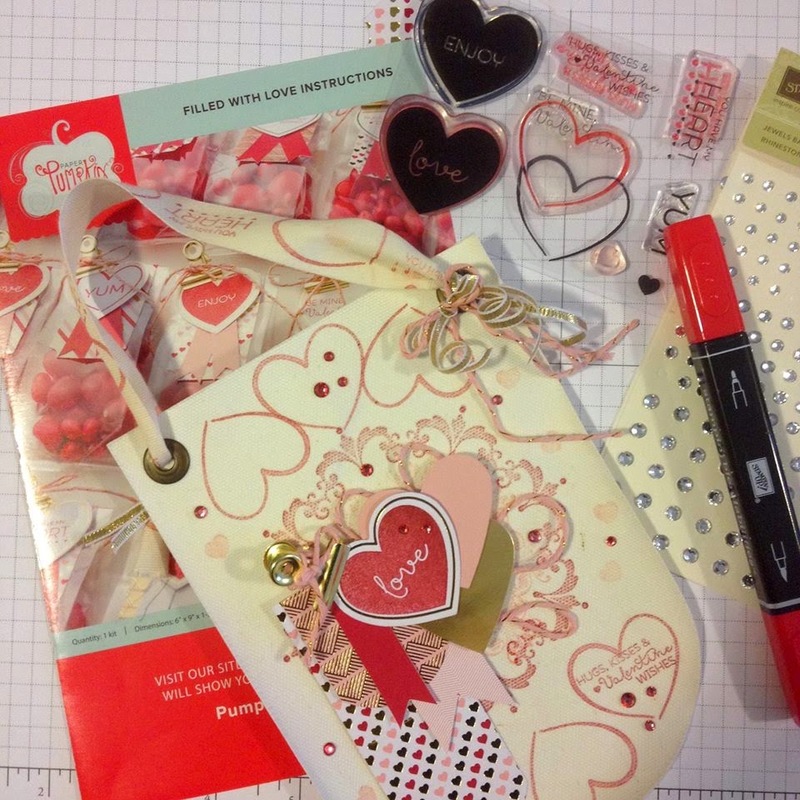 I 'love' this months Paper Pumpkin Kit! It has everything you need (but for the candy or treats) to make 24 little sparkly treat bags!! A sweet gift for your kids class, neighbors, friends or coworkers. With little gold clips, and pretty pink and gold bakers twine, and... well - lots of great stuff!! If you haven't joined Paper Pumpkin, now is a great time to try (or GIFT) a 3 month subscription! Its on sale, AND there are more holidays coming up -- you CAN make the projects in these kits!! Alternate Paper Pumpkin Project - Use the stamps and one set of treat toppers. I used a pennant from the Simply Created Build a Banner set, they're canvas with grommets and already to decorate. I stamped two of the Daydream Medallions in the center, using Real Red and Blushing Bride. Around the edge of the pennant I stamped the heart outline in red, and very small heart in pink, using the stamps from the January Paper Pumpkin kit. Love Note space created on the back of the pennant. 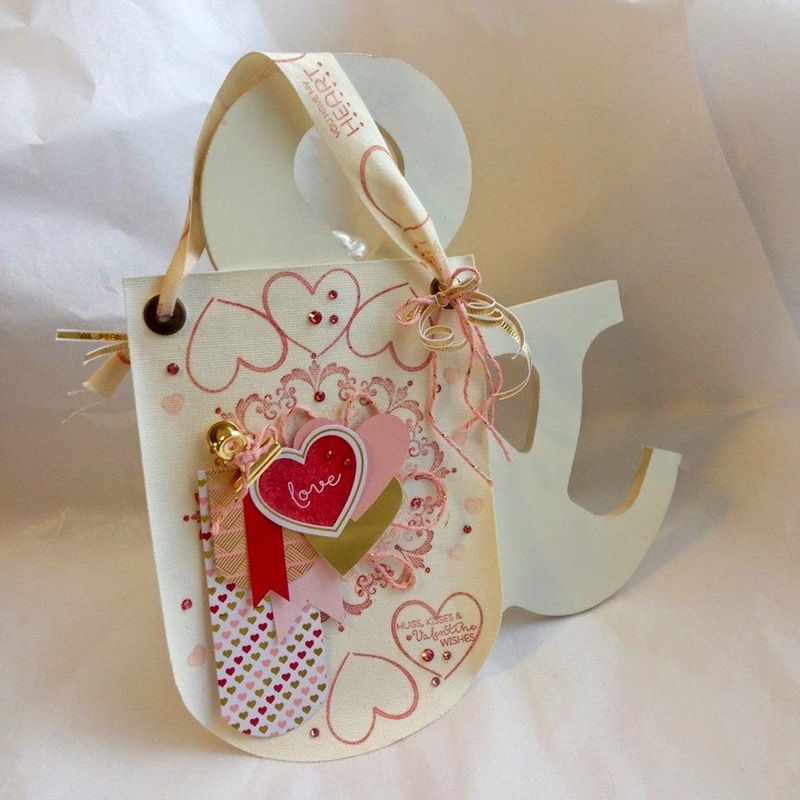 The note space I added to the back will have a little sweet note to Mr. Man, but you could use this as a gift tag on a pretty bag or add notes to your loved ones, maybe a memory of your favorite Valentine's Day. This note also gives a little strength to the canvas banner, and it will hang perfectly flat on its own. When you use them in banners, they hang fairly flat on the long cords, but as a singleton they tend to curl in or out depending on how your thread them. 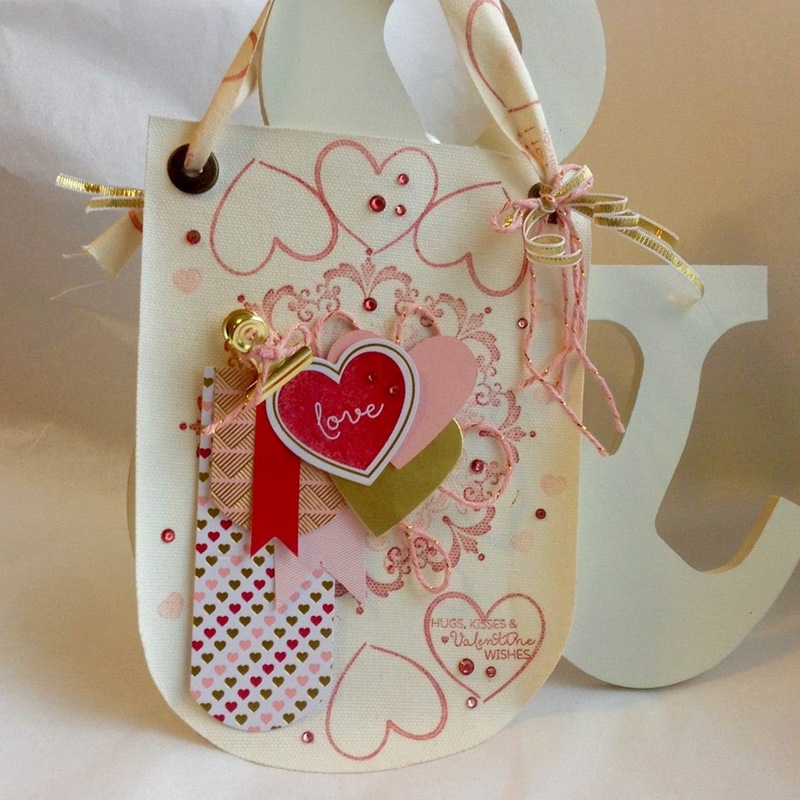 I cut hearts using the Hearts Collection Framelits, some Blushing Bride Cardstock, and the white is actually the cardboard backing from my Designer Series Paper sets. I save it because its easy to cut, but still sturdy, with framelits. 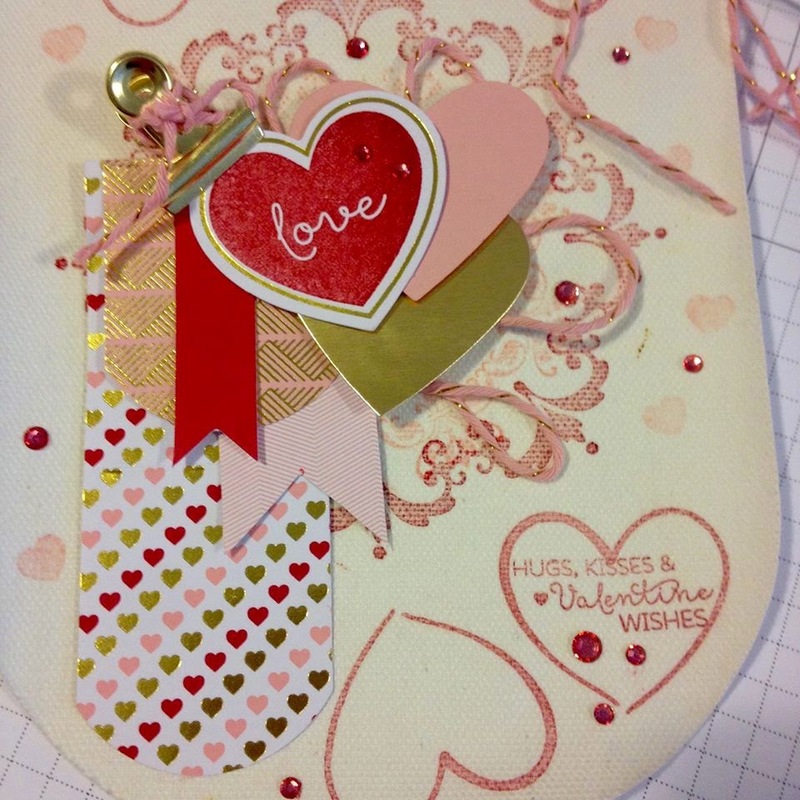 Glittery gold accents, and red sparkle, with pink and cream - classic Valentine colors!! For the front of the pennant I also cut out a heart from Gold and Blushing Bride to add color and oomph to the gold outline heart from the kit. I used one of the Paper Pumpkin stamps for the center, and then in the bottom right I added another stamp - Hugs, Kisses & Valentine Wishes. 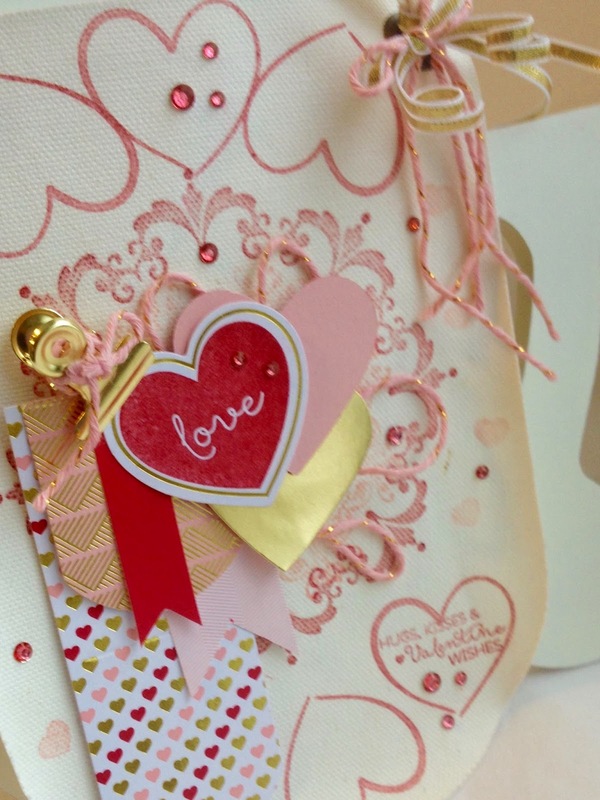 I used two of the kits banners, the hearts and the gold and pink diagonal prints. I cut both using my 1 3/4 Circle punch. I added to that a hand trimmed Blushing Bride Pink banner, and one of the little red banners from the kit. To make this stack of banners a little more stable, I used the handheld stapler to hold them all together - its hidden behind the heart! 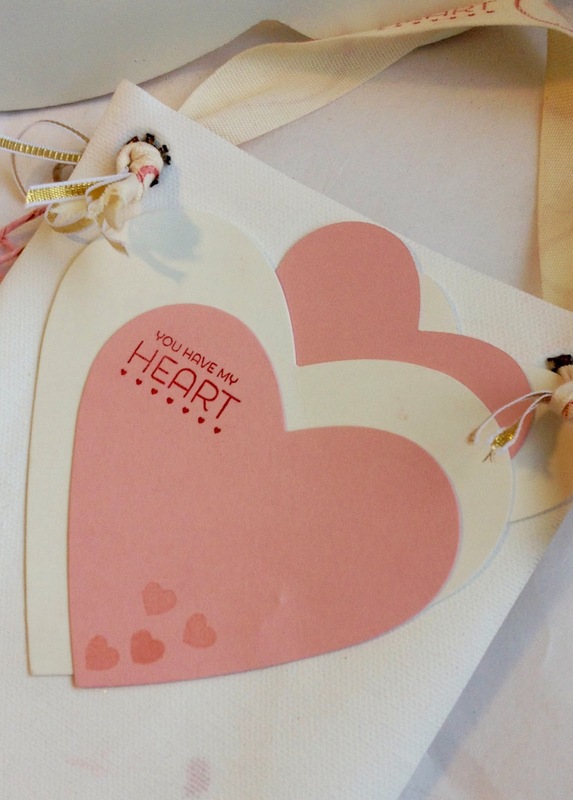 The Gold clip actually holds the top heart on, but I stuck the other hearts, string, and banner bunch on with the Jumbo Sticky Rounds - these work REALLY well with the canvas banner material and give more area to stick than just Sticky Tape. 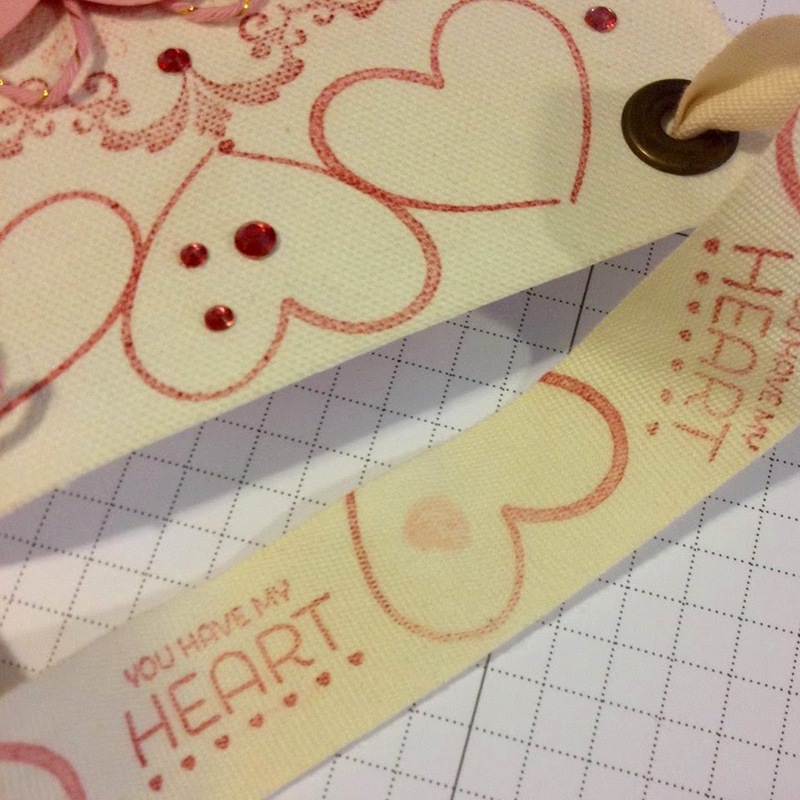 For the ribbon hanger, I stamped some of the kit stamps onto our Natural Ribbon, and tied it with some pieces of the kit's pink twine and some gold ribbon. I used my Blendabilities to color a bunch of rhinestones to match the red theme and sprinkled them liberally over the front. I think This will make an excellent decoration - once I steal it back from Mr. Man! LoL But really, very pretty in person ((If I do say so myself!! )), you should try it!! and if you're not on the list you will MISS OUT!! Exclusive and Limited Quantities of these kits are available only to members. Find out more Here and Join today! Projects used today are shown below.